Below is a collection of 1st cycle California Gulls photographed in Half Moon Bay, California in mid-September. All are hatch year birds - some still in complete juvenile plumage while others showing early 1st alternate scapulars. Subspecies unknown. (1) All juvenile scapulars, a few showing a holy-leaf pattern (a pattern that's been associated with Herrings). The mostly black bill is shown by a minority of birds in mid-September. Band information to follow. (2) Still entirely juvenile. White forehead. Bill pattern with a mixture of black not uncommon for mid-Sept.
(3) "Cinnamon" type. Pale underparts and chest partially due to bleaching but also plumage variation. Post-ocular line. (4) Cinnamon type still fully juvenile. Note the characteristic white forehead commonly shown by this age class. (5) Similar to the individual above, but more black in the bill and some smoky gray 1st alternate scapulars. (6) Smaller bird showing the famous decurved gape. Large, plain juvenile scapulars. Size variation is difficult to appreciate in photos, but what is obvious from these images is the immense variation in upperpart patterns and coloration. (7) A bigger and darker Herring-sized bird. A few dark gray alternate scapulars mixed in. Note the long-winged look. (8) Moderate post-juvenile scapular molt. More typical plumage aspect. Blue-gray tibia can be shown at this age. (9) Longish bill, straight and skinny, with typical two-toned pattern. Moderate scapular renewal. Neater lesser/median upperwing coverts. (10) Large individual with larger bill and head proportions (male?). Upperparts more worn than average. (11) Small bill. Variegated look to upperarts becomes more common as the season progresses. Classic anchor pattern on the lower scapulars. Replaced upper tertial? (12) Very plain greater and median coverts. Note the dark post-ocular line. Undertail coverts plainer than most Herrings. (13) A darker cinnamon type with smoky gray post-juvenile scapulars. Matching some Western Gulls in size. Massive. (14) Extensive post-juvenile scapular replacement. Variegated and dark-gray scapular centers advanced. A few renewed lesser upperwing coverts and a renewed greater upperwing covert. Undertail coverts generally not as neatly barred as Herring. Lower hindneck blotchy with a heavily greased look. 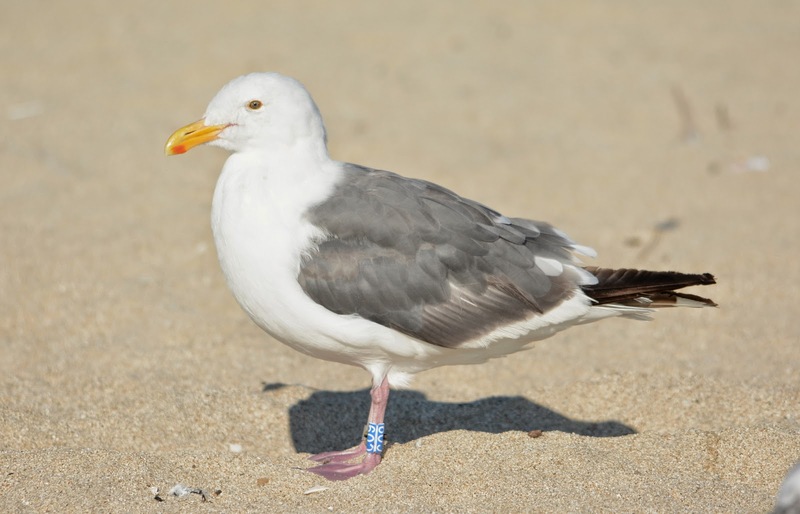 Overall, 1st cycle California Gulls have upperwing coverts that are weakly patterned and not as neatly shaped as similar-aged Herrings. Their bills are mostly straight with little expansion to the gonys. By early October the bill pattern is two-toned on almost all individuals, but some birds can exceptionally retain a mostly black bill into late October. On average, the species appears shorter and smaller than Herring but slimmer towards the rear with longer wings. The Bird Banding Lab gave the following: Banded June 25, 2013 (too young to fly); NE Jack Island, Door County, Wisconsin. Incidentally, this is my 4th banded HERG that I've found in New Buffalo that's been banded on Jack Island. Are a lot of these birds migrating straight south along/over Lake Michigan? Do they migrate together? Do they remain on southern Lake Michigan until they're ready to breed, or do they migrate back north in the Spring? Map from Jack Island (WI) to New Buffalo (MI). Roughly 300 miles. This individual shows rather typical 2nd basic primaries and secondaries. The underparts have a bit more dark wash than average, and the scapulars are not as advanced with gray as many similar-aged 2nd cycle Herrings. Also, the uppertail coverts are more barred than what I believe the average 2nd cycle shows. In many ways, this bird is less advanced than what I consider typical of 2nd cycle American Herrings. Herring Gull (2nd/3rd? cycle). Whiting, Indiana. 04 Jan 2013. Peter Adriaens once commented on this bird and mentioned that similar-looking European Herrings, of known-age, showing these advanced inner primaries, almost always turn out to be 3rd cycle individuals. Could it be that many of our Herrings become definitive adults in 5 plumage cycles? Chicago, IL. 26 Oct 2012. Advanced 2nd cycle or delayed 3rd cycle? I'm hopeful that more data from banded American Herrings will help shed some light on this ageing question, in due time. American Herring. New Buffalo, MI; 21 Sept 2014. To read more about the other 3 banded Herrings (HY birds) from Door County, Wisconsin, that I previously found in New Buffalo, click here. One of the fun things about watching large flocks of Western Gulls on the California coast is knowing there's that great chance of almost always encountering a banded individual. All of the banded WEGUs that I've found in California in the past have been from the Southeast Farallon Islands, but last weekend, I found an adult type with a large blue plastic ring - I immediately sensed it wasn't from the Farallon Islands! 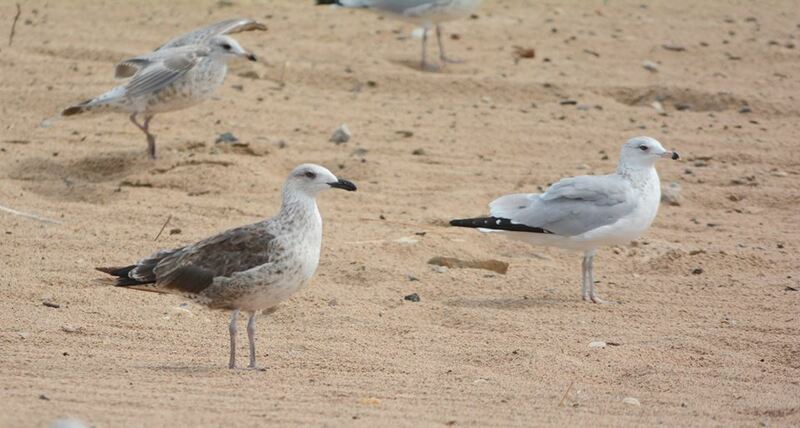 Adult Western Gull (BLUE C09). Half Moon Bay, CA. 12 Sept 2014. Data logger attached to plastic leg band. 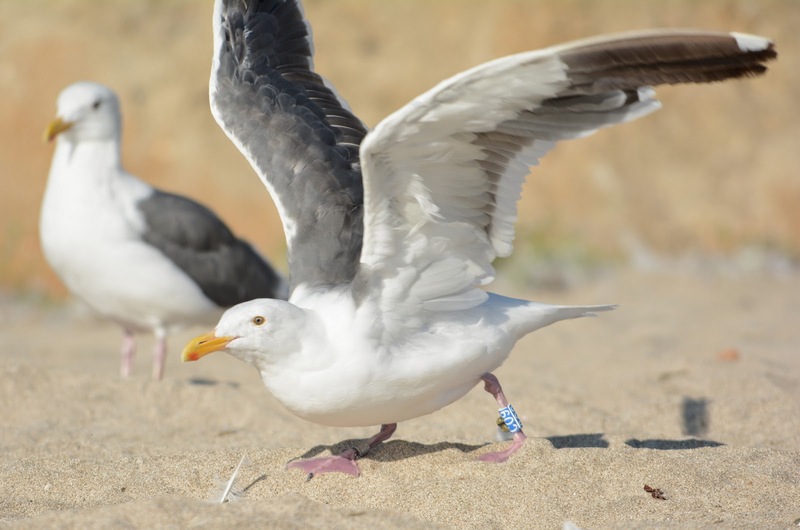 After doing a little homework I learned that this gull was banded by Dr. Scott Shaffer on Ano Nuevo Island (a small 9 acre island just off the coast between San Francisco and Santa Cruz). 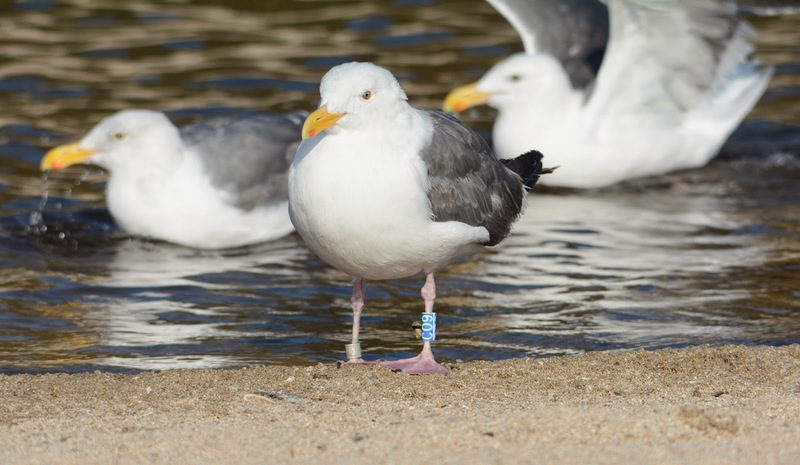 Scott and several of his students from San Jose State University have banded and fitted 11 Western Gulls with these blue plastic bands and data loggers (sequence C00-C10). 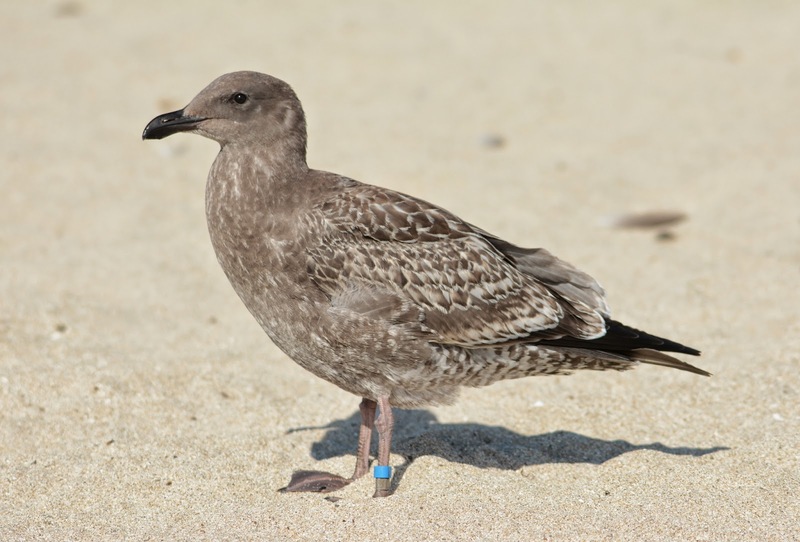 C09 was banded in June of 2013 as an adult near its nest. As of this post, it had not been recaptured (5 others have since been recaptured and their past whereabouts were revealed via the GPS loggers). Three outer primaries (p8-p10) retained from previous plumage. Inner primaries new. The epicenter shown above is Ano Nuevo Island. Each color is representative of a unique individual. 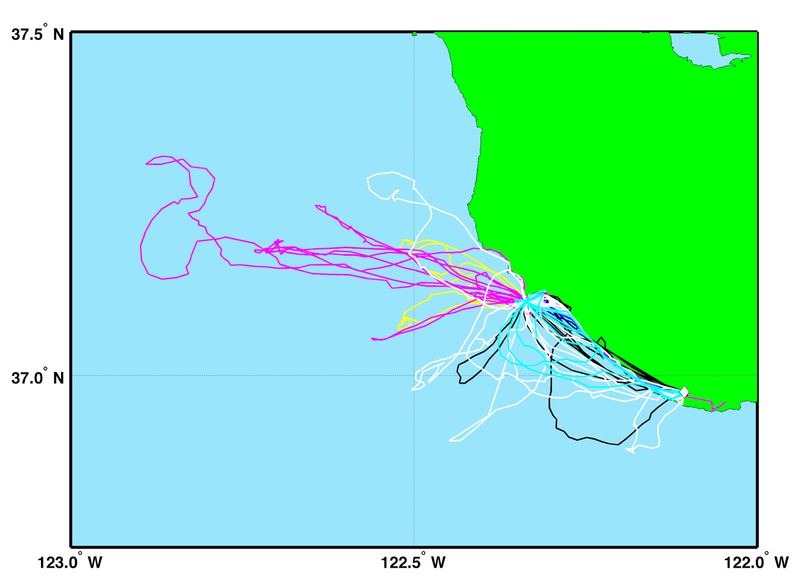 For the most part, the map shows much of what we already know about this species: Western Gulls are largely non-migratory (in the traditional sense) and are relatively sedentary. I do want to add that C09 was very easy to pick out of the flock due to the large blue leg band. 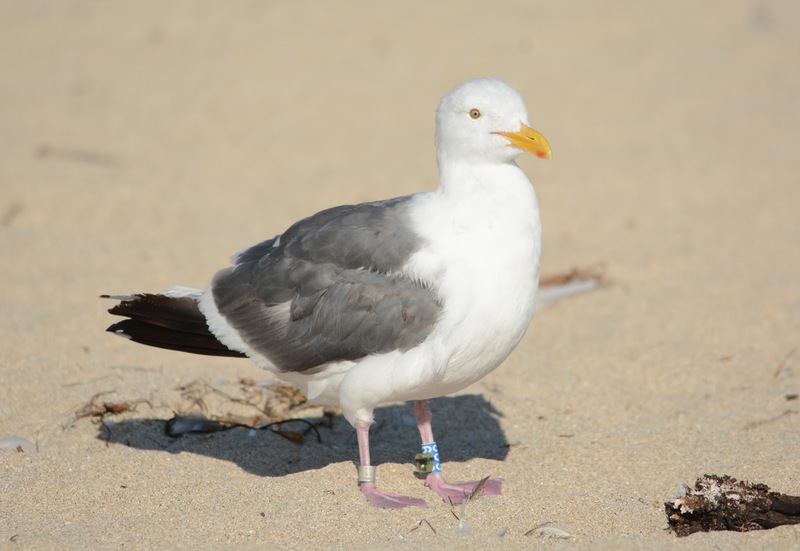 I've said this many times, and I'm beginning to sound like a broken record: gull banders would get so much more data from the public (birders in particular) if they used these large color bands. Win-win! Adult type Western Gull. Federal band (right leg) and small red plastic band (left leg). Half Moon Bay, CA. 12 Sept 2014. Juvenile Western Gull. Federal band (left leg) and small blue plastic band (left leg). Half Moon Bay, CA. 12 Sept 2014. Juvenile Ring-billed Gull. Manitowoc, Wisconsin. 07 September 2014. 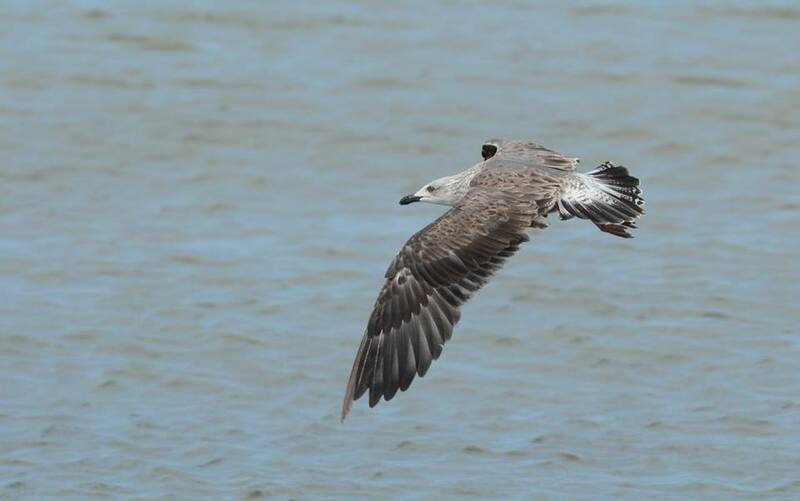 The effects of fault bars (also referred to as stress bars) are sometimes subtle and insignificant, showing just a bit of discoloration with no feather damage (as is seen on this gull's primaries). But fault bars can also result in complete feather breakage. First winter Ring-billed with feather damage along fault bar on primaries. Tinley Park, IL. April 2014. The implication of any loss in feather-area is a higher demand in energy to maintain flight, which ultimately results in more expensive fitness costs. Overall, I've found that after-hatch-year gulls (AHY), with traces of fault-bar damage from 1st basic, tend to look less fit and have considerably worn and bleached plumages. This shouldn't be too hard to believe as selection is probably weeding these individuals out. If they can survive until they complete their next prebasic molt, then chances are they'll fair well. 1st summer Ring-billed Gull. Chicago, Illinois. 05 June 2013. Ring-billed with undamaged feathers (left). Ring-billed with fault-bar damage (right). Interestingly, juveniles are more frequently recorded with fault bars, or at least a more consistent pattern is observable on juveniles than that of older birds. The unique phenomenon in juvenile fault-bar patterns is that they grow at the same length across the feather axis (since juvenile feathers grow simultaneously, unlike second year birds and beyond). So what causes fault bars to emerge? The latest studies in the literature agree that fault bars are the result of an acute stressor (Jovani et al. Journal of Avian Biology; 43:97-101, 2012). Ornithologists have long studied their causes and there's primarily two explanations given: malnutrition during feather formation, and/or, severe physiological stress during feather growth. There's been some fascinating studies conducted on captive birds in this regard -- often times using methods that would easily perturb the average person. Being the opportunistic feeders that they are, large gulls prey on just about anything on the food chain that doesn't threaten them, including passerines. On Saturday, I and a large congregation of birders observed Ring-billed Gulls methodically hunting incoming migrant song-birds at Miller Beach along the southern rim of Lake Michigan. The gulls patiently sit on the shoreline and await their subjects coming in off of the lake. Juvenile Herring (left), 2nd cycle Ring-billed (center), juvenile Ring-billed (right). Gary, Indiana; 06 September 2014.
point of Lake Michigan in Gary, Indiana. Twice I watched distant warblers flutter in to shore like exhausted butterflies, while keeping a close eye on them and the gulls. The death-sentence was issued as soon as the Ring-billeds would detect the passerine. The gulls would fly out over the water and meet the incoming migrant. Most impressive is how swiftly the Ring-billeds catch these birds in mid-air with their bills. Juvenile Ring-billed with Blackpoll Warbler. 2nd cycle Ring-billed with unidentified warbler species. Many people have tried guessing the ID of the warbler above with no success. Most votes were for Yellow-throated Warbler, Blackburnian or Common Yellow-throat, but there was also the dreaded suggestion that it may be a Kirtland's - as if gulls need another reason to be resented. Herrings commonly kleptoparasitize Ring-billeds in hopes of them dropping their prey, and it was no different during Saturday's lakewatch. A few of us witnessed a juvenile Herring harass a Ring-billed until it dropped an American Redstart from its bill - the Herring quickly swallowed the entire redstart with little effort. But Herrings weren't the only ones hunting on this day. We also watched a Long-tailed Jaeger with a passerine in its bill that it had retrieved along the beach to the west of us. It struggled with a Parastic Jaeger, apparently for this same song-bird, but both jaegers were subsequently chased off the beach by a Peregrine Falcon. We couldn't determine whether the jaegers came to shore to steal the passerine from a gull, or if they themselves caught the song-bird. Sub-adult Long-tailed Jaeger with song-bird in bill. Gary, Indiana. 06 September 2014. 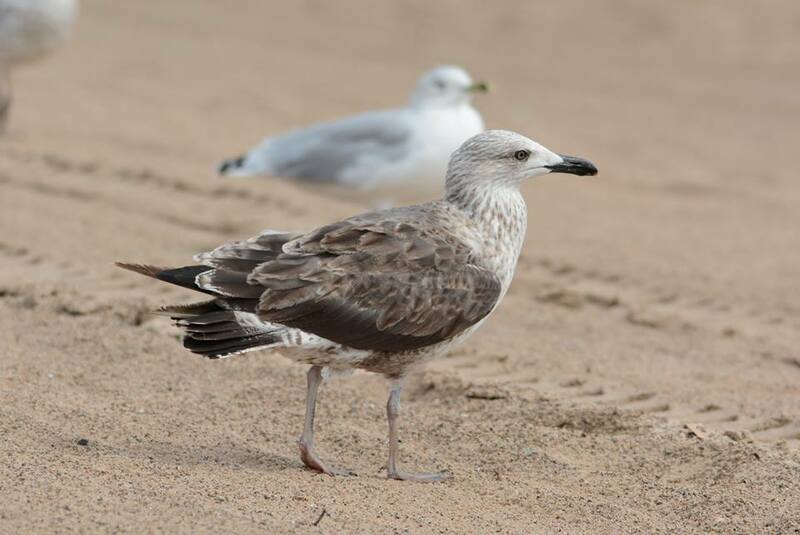 There can be no question that gulls are quite predatory and it certainly isn't the first time we've heard of such behavior of them taking song-birds. Other observers have reported similar occurrences along the Great Lakes and beyond. Nietlisbach et al. published a short paper earlier this year that documents Glaucous-winged Gulls preying on Sooty Fox Sparrows, Song Sparrows and European Starlings during the breeding season in British Columbia. 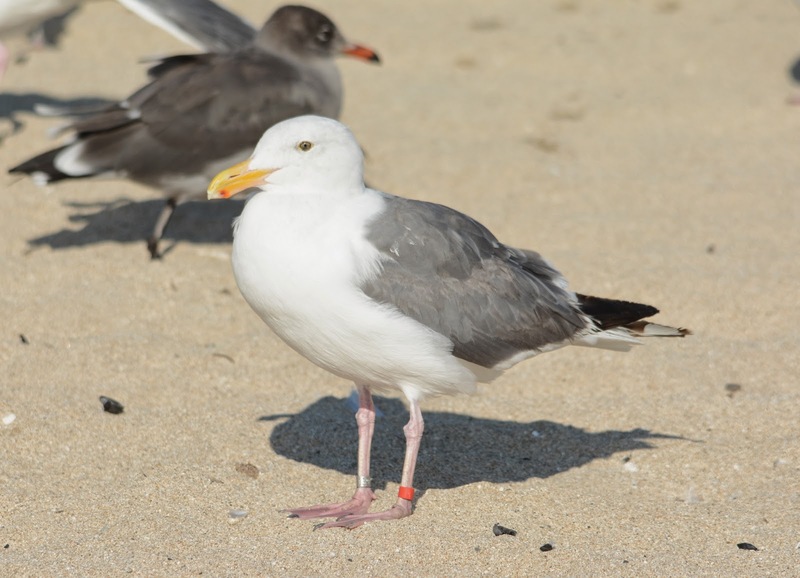 Gull pellets have verified this via metal leg bands found in active nests (The Wilson Journal of Ornithology, 126(1):155-158, 2014). Charles Sontag informed me yesterday that he has first-hand experience with gulls regularly taking song-birds in agricultural fields in Wisconsin. The common thought is that gulls are out in these fields feeding on worms and insects, and although this may be what they're predominately feeding on, evidently, they don't pass up the chance to take small passerines. Finally, here's a fine set of photos by Cory DeStein that documents California Gulls hunting Cliff Swallows in Montana! This last example is of particular importance because swallows are about as agile as it gets in the avian world. Can California Gulls keep up with swallows in flight?? 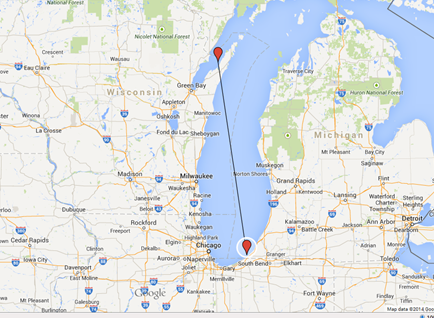 I've yet to see a gull attempt to go for a swallow over the large open waters of Lake Michigan. The Montana record doesn't demonstrate otherwise, but rather, it shows how gulls can become skilled at calculating an ambush. 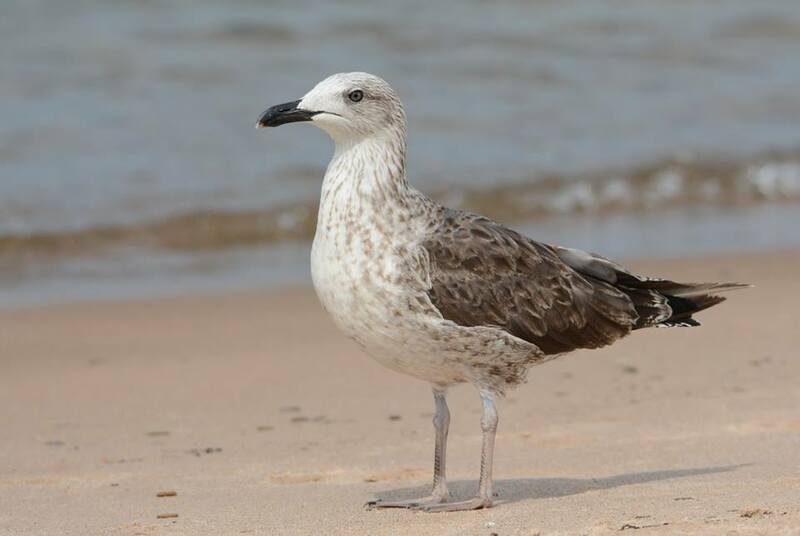 This first summer Lesser Black-backed Gull has been hanging out at the beach in Michigan City for the last week or so. LBBG (first summer). Michigan City, IN. 01 Sept 2014. P1-P8 new 2nd basic, P9 dropped, P10 retained 1st basic (=juvenile). An interesting experience while observing this bird, a young boy, perhaps, 10 or 11 years old walked up to us and asked if he can feed the gulls a piece of bread. Well, he did, after picking up a 2nd cycle Ring-billed and hand feeding it...this was a bizarre experience, but it was obvious this boy was used to handling birds in the hand.